Keep your hair healthy by using less chemicals and heat. In the world of beauty, the grass seems greener on the other side. Curly-haired women long for straight locks while brunettes wonder what they'd look like as blondes or redheads. Though chemical processing quickly brings a new look, too much of it can bring devastation on otherwise healthy hair. Understand the hair follicle, what too much chemical processing does to it and how best to treat dry, over-processed hair. A hair strand is made of a protein called keratin and is comprised of two main components. The soft inner structure is protected by strong, overlapping scales of the outer cuticle. When the outer structure is damaged, the scales flare outward, leaving hair with a dry, frizzy look. With the outer scales not protecting the inner core, the strand is further susceptible to damage from ultraviolet light, air pollution, heating tools and chemicals from water, shampoo and other hair products. Over time, the damage can result in spit ends and breakage. Over-processing the hair is the most common type of hair damage as the outer scales are opened in order for the product to reach the inner section. Perming or straightening the hair rearranges the chemical bonds of the inner hair cuticle. Bleaching or coloring hair removes or adds pigment to the inner structure. Overuse or improper use of these harsh products weakens the strands and can permanently damage the hair. This occurs if the concentration of chemicals is too high, the product is left on for too long or if the cuticle is too often subjected to the chemicals. 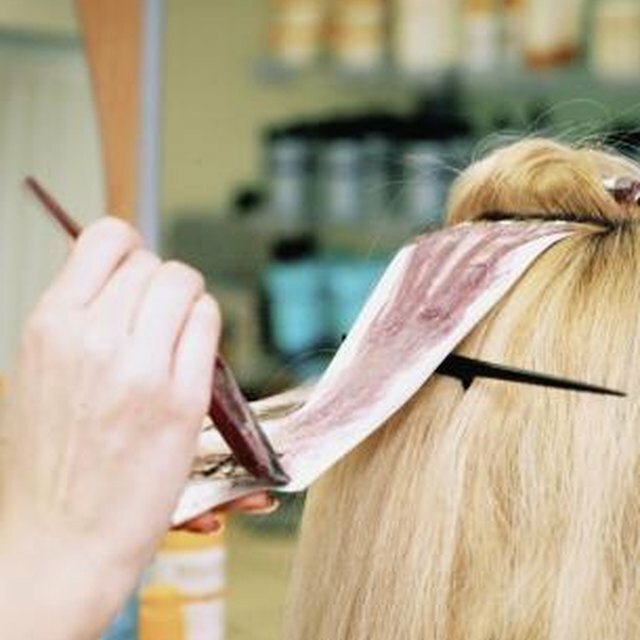 Once the damage is done, the quickest way to treat the hair is to cut off as much as you can part with. Ideally, hair should be trimmed every eight to 12 weeks to prevent split ends from traveling up the hair shaft. In the mean time, be gentle with your hair while the untreated strands grow in; this means very little to no processing. If you must continue dyeing the hair, request your stylist do only a root touch up instead of coloring the entire strand. Alternatively, opt for semi-permanent color which is less damaging than permanent color. Color your hair, at most, every six to eight weeks. The effects of chemical straightening and perms last much longer and so there is no need to go more often than every four to six months. Keep in mind the healthiest choice for your hair is to refrain from coloring, perming or chemically straightening it. There are other ways to pamper hair damaged from over-processing. Limit shampooing to every other day, at most, and use a moisturizing leave-in conditioner once a week. Hair is most delicate when wet so it is best to brush with a wide tooth comb, starting from the ends and working your way up to the roots to avoid rough tugging or tangling which can cause breakage. Minimize the amount and number of styling products you use and don't forget to give your hair an occasional break from heating tools.